Since my muse apparently said "too cold here, I am going to Mexico without you!" I have been trying to stir up some inspiration. I came across a free pattern on a blog so I decided to pull out some pre-fused fabric and play. 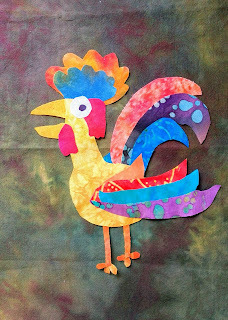 Mine is a bit different as I free cut a few pieces, but here is the Funky Chicken placed on a dark fabric so it shows well. Someday, maybe next week, maybe next year - who knows? I will decide on a background and finish off this bird. For now, I am still waiting for the muse to say "Surprise, I am back - let's get to work." Love it!!! I wanna go to Mexico too!! Oh my gosh, that's cute and funny! How cute! A black background will make the colors pop! Senor chicken is quite the colorful chap isn't he ! Oh my, I LOVE this hilarious chicken! The chicken is adorable! Looking forward to seeing what you do with it. Very unique. Happy holiday wishes to you.